Water levels on the Findhorn are rain and snowmelt dependent so there are many times of the year when levels are too low for rafting. If this is the case while you are visiting Aviemore, we will take you on the equally awesome and exciting Adventure White Water River Tubing which is good whatever the water level. We also change to WW River Tubing if less than 10 people are booked to raft. White Water Rafting in the Scottish Highlands from our Aviemore base. We use the River Findhorn and occasionally the River Feshie if there’s been lots of rain. 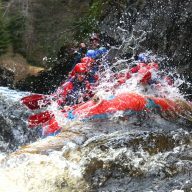 We also run mellow trips for 5yrs and up on the River Spey as family rafting scenic float trips. 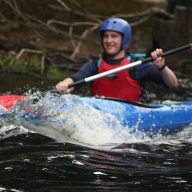 Choose the best adventure for the river levels and time of year. The River Feshie in the Cairngorms National Park (a favourite of white water kayakers) and most of the time better for White Water Tubing than White Water Rafting, we only raft it if too high to tube. The River Feshie is a ten minute drive from our Aviemore changing rooms. White Water Tubing is even more exciting than White Water Rafting and the same type of activity. 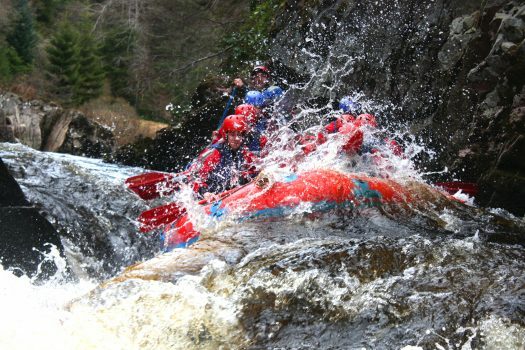 Each November, and from late March to mid May, the River Findhorn has the UK’s best white water for rafting. During the summer we strongly recommend Adventure Water River Tubing as an alternative. In Scotland we dont have glaciers to keep the rivers up for rafting in July and August. Aviemore first White Water Rafting company. 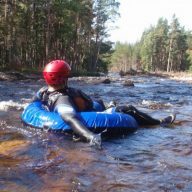 We’ve been rafting the River Findhorn and other Cairngorms area rivers since 1997, and so have amazing guides with years of experience. Coming up on our 20th year rafting from Aviemore, you know you’re in good hands. and if we say go Adventure Tubing not Rafting you’ll know it is good advice based on years of experience rafting the Scottish Highlands. 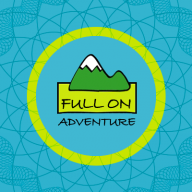 Our goal is for your trip to be the best possible white water adventure. Experience real wilderness and white water. 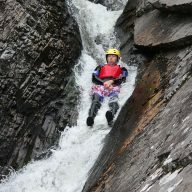 Enjoy a rush of adrenaline, the beauty of the Scottish nature, sandy river beaches and rocky gorges. 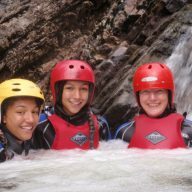 White water rafting the way it should be done, the Full On Adventure way!